SignalR では、ユーザーを認証するための機能は提供されません。SignalR does not provide any features for authenticating users. 代わりに、アプリケーションの既存の認証の構造に SignalR の機能を統合します。Instead, you integrate the SignalR features into the existing authentication structure for an application. 通常、SignalR での認証の結果での作業、アプリケーションでのコードは、ユーザーを認証します。You authenticate users as you would normally in your application, and work with the results of the authentication in your SignalR code. たとえば、ASP.NET フォーム認証でユーザー認証を行うし、ハブ内にユーザーを適用する場合があります。 またはメソッドを呼び出す権限がロール。For example, you might authenticate your users with ASP.NET forms authentication, and then in your hub, enforce which users or roles are authorized to call a method. ハブでユーザー名またはユーザーがクライアントに、ロールに属しているかどうかなどの認証情報を渡すこともできます。In your hub, you can also pass authentication information, such as user name or whether a user belongs to a role, to the client. 適用する、Authorize属性をハブがいない永続的な接続します。You apply the Authorize attribute to hubs, but not persistent connections. 使用する場合は、承認規則を適用する、PersistentConnectionオーバーライドする必要があります、AuthorizeRequestメソッド。To enforce authorization rules when using a PersistentConnection you must override the AuthorizeRequest method. 永続的な接続の詳細については、次を参照してください。 SignalR 永続的な接続の認証と承認します。For more information about persistent connections, see Authentication and Authorization for SignalR Persistent Connections. SignalR では、送信者の id を検証することで悪意のあるコマンドを実行するリスクを軽減します。SignalR mitigates the risk of executing malicious commands by validating the identity of the sender. 要求ごとに、クライアントとサーバー接続の id と認証されたユーザーのユーザー名が含まれた接続トークンを渡します。For each request, the client and server pass a connection token which contains the connection id and username for authenticated users. 接続 id は、各接続のクライアントを一意に識別します。The connection id uniquely identifies each connected client. サーバーは、新しい接続が作成され、接続の間にその id が解決しない場合、接続 id をランダムに生成します。The server randomly generates the connection id when a new connection is created, and persists that id for the duration of the connection. Web アプリケーションの認証メカニズムは、ユーザー名を提供します。The authentication mechanism for the web application provides the username. SignalR は、接続トークンを保護するのに暗号化とデジタル署名を使用します。SignalR uses encryption and a digital signature to protect the connection token. セッション トークンや認証トークンは、公開されている場合の危険にするため、セキュリティ ツールで接続トークンはフラグが場合があります。Connection tokens are occasionally flagged by security tools because they appear to be session tokens or authentication tokens, which poses a risk if exposed. 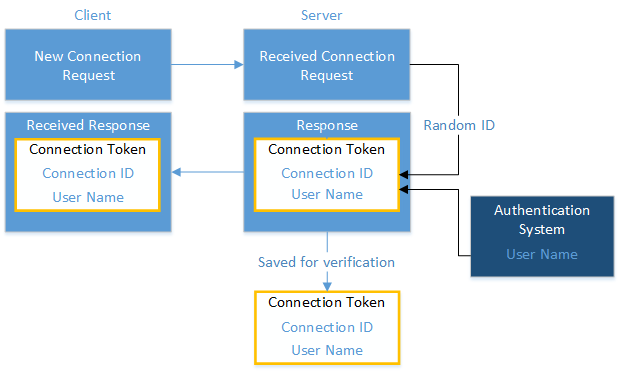 SignalR の接続トークンは、認証トークンはありません。SignalR's connection token isn't an authentication token. この要求を行ったユーザーが接続を作成したものと同じであることを確認に使用されます。It is used to confirm that the user making this request is the same one that created the connection. 接続トークンは、ASP.NET SignalR のサーバー間で移動する接続を許可するために必要があります。The connection token is necessary because ASP.NET SignalR allows connections to move between servers. トークンは、接続が特定のユーザーに関連付けられますが、要求を行ったユーザーの id をアサートしません。The token associates the connection with a particular user but doesn't assert the identity of the user making the request. SignalR 要求の認証が正しくが、他の cookie など、ユーザーの id をアサートするトークンまたはベアラー トークンが必要です。For a SignalR request to be properly authenticated, it must have some other token that asserts the identity of the user, such as a cookie or bearer token. ただし、接続トークン自体はそのユーザーに関連付けられた接続 ID は、トークン内に含まれるそれだけで、そのユーザーが、要求が行われた要求はありません。However, the connection token itself makes no claim that the request was made by that user, only that the connection ID contained within the token is associated with that user. 接続トークンは、独自の認証要求を提供しないため、見なさなかった「セッション」または"authentication"トークンです。Since the connection token provides no authentication claim of its own, it isn't considered a "session" or "authentication" token. 指定したユーザーの接続のトークンを取得し、別のユーザーとして認証された要求 (または、要求を認証されていない) でそれを再生するため失敗します、要求のユーザー id とトークンに格納されている id が一致しません。Taking a given user's connection token and replaying it in a request authenticated as a different user (or an unauthenticated request) will fail, because the user identity of the request and the identity stored in the token won't match. ただしに注意してください、グループのトークンが失効しないことができます。However, it's important to note, that the group token does not expire. ユーザーが以前は、グループに属しているかが、そのグループから禁止されていますが、そのユーザーは禁止されているグループを含むグループ トークンを模倣することがあります。If a user belonged to a group in the past, but was banned from that group, that user may be able to mimic a group token that includes the prohibited group. どのグループに属するユーザーを安全に管理する必要がある場合は、データベースのようにサーバーで、そのデータを格納する必要があります。If you need to securely manage which users belong to which groups, you need to store that data on the server, such as in a database. 次に、サーバーで、ユーザーがグループに属しているかどうかを検証するアプリケーション ロジックを追加します。Then, add logic to your application that verifies on the server whether a user belongs to a group. グループ メンバーシップの確認の例は、次を参照してください。グループの操作します。For an example of verifying group membership, see Working with groups. www.example.com にユーザーが、フォーム認証の使用します。A user logs into www.example.com, using forms authentication. SignalR は、悪意のあるサイトが、アプリケーションに有効な要求を作成するを防ぐために、次の手順を受け取ります。SignalR takes the following steps to prevent a malicious site from creating valid requests to your application. SignalR は、次の手順を既定では、コードで何もする必要はありません。SignalR takes these steps by default, you do not need to take any action in your code. クロス ドメイン要求を無効にするSignalR は、ユーザーが、外部ドメインから SignalR エンドポイントを呼び出すことを防止するクロス ドメイン要求を無効にします。Disable cross domain requests SignalR disables cross domain requests to prevent users from calling a SignalR endpoint from an external domain. SignalR では、無効である、外部ドメインのすべての要求を考慮し、要求をブロックします。SignalR considers any request from an external domain to be invalid and blocks the request. この既定の動作を維持することをお勧めします。それ以外の場合、悪意のあるサイトでは、サイトにコマンドを送信するのにユーザーをだましてでした。We recommend that you keep this default behavior; otherwise, a malicious site could trick users into sending commands to your site. クロス ドメイン要求を使用する必要がある場合は、次を参照してください。ドメイン間の接続を確立する方法します。If you need to use cross domain requests, see How to establish a cross-domain connection . クエリ文字列、cookie ではない接続トークンを渡すSignalR は、の代わりにクエリ文字列の値として接続トークンを cookie として渡します。Pass connection token in query string, not cookie SignalR passes the connection token as a query string value, instead of as a cookie. 悪意のあるコードが発生した場合に、ブラウザーは接続トークンを転送誤ってできるため、接続トークンを cookie に格納するセーフはありません。Storing the connection token in a cookie is unsafe because the browser can inadvertently forward the connection token when malicious code is encountered. また、クエリ文字列で接続トークンを渡すの現在の接続を超える永続化接続トークンが防止します。Also, passing the connection token in the query string prevents the connection token from persisting beyond the current connection. そのため、悪意のあるユーザーは、別のユーザーの認証の資格情報で要求を作成することはできません。Therefore, a malicious user cannot make a request under another user's authentication credentials. 接続トークンを確認します。 」の説明に従って、接続トークン セクションで、サーバーでは、どの接続 id が各認証済みユーザーに関連付けられたがわかっています。Verify connection token As described in the Connection token section, the server knows which connection id is associated with each authenticated user. サーバーは、ユーザー名と一致しない接続 id からの要求を処理しません。The server does not process any request from a connection id that does not match the user name. 悪意のあるユーザーは、ユーザー名と、現在の接続をランダムに生成された id を知っている必要があるために、悪意のあるユーザーは有効な要求を推測でした可能性が高いことはできません。接続が終了するとすぐに、その接続 id が無効になります。It is unlikely a malicious user could guess a valid request because the malicious user would have to know the user name and the current randomly-generated connection id. That connection id becomes invalid as soon as the connection is ended. 匿名ユーザーには、機密情報へのアクセスはありません。Anonymous users should not have access to any sensitive information. 悪意のあるユーザーが他のユーザーにスクリプトを送信しないことを確認するには、他のクライアントへのブロードキャストが想定されているクライアントからのすべての入力をエンコードする必要があります。To ensure that a malicious user does not send script to other users, you must encode all input from clients that is intended for broadcast to other clients. SignalR アプリケーションのさまざまな種類のクライアントの可能性があるため、サーバーではなく、受信側のクライアントにメッセージをエンコードする必要があります。You should encode messages on the receiving clients rather than the server, because your SignalR application may have many different types of clients. そのため、HTML エンコードと、web クライアントの場合、その他の種類のクライアントではなくは機能します。Therefore, HTML-encoding works for a web client, but not for other types of clients. たとえば、チャット メッセージを表示する web クライアントのメソッドは安全に処理、ユーザー名とメッセージ呼び出すことによって、html()関数。For example, a web client method to display a chat message would safely handle the user name and message by calling the html() function.